The 82nd Academy Awards ceremony, presented by the Academy of Motion Picture Arts and Sciences, will honor the best films of 2009 and will take place March 7, 2010, at the Kodak Theatre in Hollywood, Los Angeles, California. It will be televised in the United States on ABC. 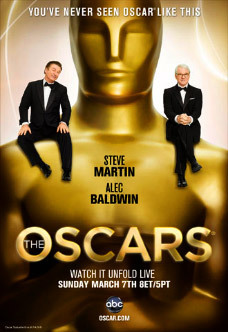 Actors Alec Baldwin and Steve Martin will host the show. Martin will host for the third time, after previously presiding over the 73rd and 75th ceremonies, while Baldwin will host the show for the first time.